What is desktop transformation? What role can it play in your organization? And what benefits can it deliver to your IT team and your employees? This resource explores these and other questions, as well as a new desktop strategy that can help you streamline operations, improve productivity, enhance security, and give your end users freedom. 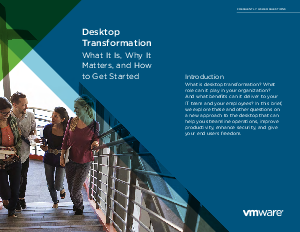 Access now and you’ll take a look at eight frequently asked questions about desktop transformation and how you can get your project started today.